We are just back from the auctions, here a quick feedback on the auction held by the Bernkasteler Ring. The wines showed beautifully well and in line with our expectations (see here the full report which we published early August). In particular there were quite some highlights among the sweet Auslese and the BA / TBA / Eiswein. Also, there were many mature wines, which is a nice way to enjoy the glory of Mosel Riesling. The QPR trophy must go to the gorgeous 2003 and 2004 auction wines re-released by the Johann Peter Reinert Estate. These went for a "meager" €20-22. However, unlike previous years, prices were on the whole surprisingly high, even VERY HIGH for some wines. However, once the shock of the hole in the bank account digested, those who bought some of these gems we recommended are in for some great moments of pleasure if they are patient enough to wait! 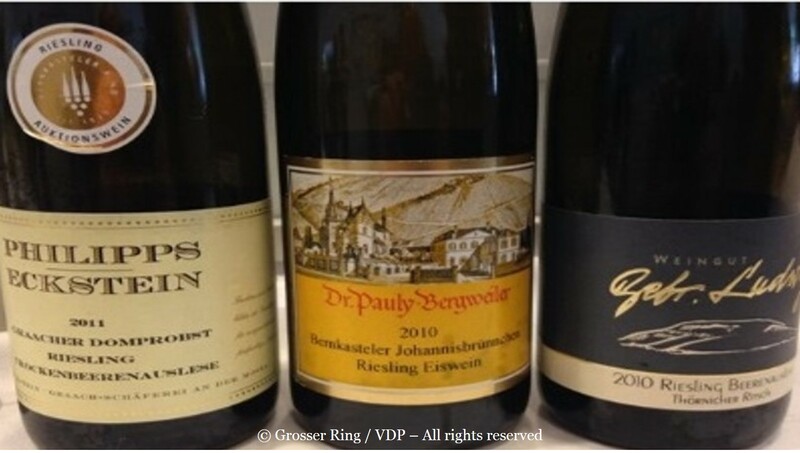 A detailed update on the auction, including tasting notes for the wines not yet tasted and details on the hammer prices, will appear as usual in Mosel Fine Wines Issue No 26 (Oct 2014). Note: In this article, we refer to the hammer price (i.e. before commission fees, sales tax and any shipping costs), as these additional costs may depend on the region in which the buyer of these wines live.